A huge building considering what few facilities it offers, Bangor is a bit of a relic in a far corner of Wales. First two hours free for all vehicles, after which cars must pay £6 and other vehicles £7. Prices can be paid at the pay and display machines in each parking area. Fees are strictly enforced by APCOA. Large restaurant or small service area? Inside it's hard to tell. The lack of services on the A55 and the A5 in this area may come as a bit of a surprise, considering how important they are. There are local facilities (both signposted and not-signposted) along both of these roads, but few services. Top Rank saw this as an opportunity to build one of their smaller services, while providing one of the biggest services in the region. 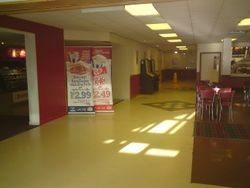 It had one corridor running through the middle with a shop on the left, and a restaurant on the right. The motel joins the main building on the left. Until 2017, the amenity building was still partly painted in Pavilion's green. It is now painted in Travelodge's corporate blue. Top Rank became Pavilion and in 1994 Pavilion sold it to Forte, as they needed money and decided they'd rather focus on motorways. Pavilion wanted £750,000 for the services, although it's not thought that they got this. Forte changed the restaurant to become a large Little Chef, the shop to a Little Chef Shop and the hotel to a Forte Travelodge. As Little Chef was then passed through various owners, it gained a Coffee Stop, Café Nescafe, Burger King, Coffee Tempo! and a Little Chef Express. For a time, it was a Little Chef Choices site with Caffè Ritazza and Harry Ramsden's menus. In March 2015, Euro Garages bought the petrol station and submitted planning permission to demolish it and replace the facilities with a BP forecourt, Spar store and Starbucks on the Go, Subway and Greggs food facilities as well as a Starbucks drive thru across the forecourt. This was due to be completed by the end of 2016, but did not happen due to planning permission refusals. In February 2017, Euro Garages acquired Little Chef and announced plans to close the restaurant. In April 2017, a Subway opened in the existing forecourt. Then, during early 2018, the Little Chef was re-branded as EG Diner and Euro Garages finally gained approved planning permission for the Starbucks Drive Thru and forecourt refurbishment. The filling station reopened branded Esso in June 2018 with a Spar store, Greggs and Subway stores and Starbucks on the Go machines. The Starbucks Drive Thru opened on Friday 3 August 2018. 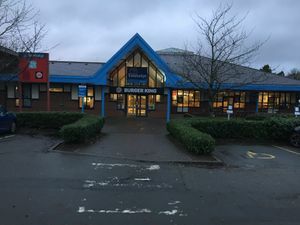 EG Diner closed in October 2018 as Euro Garages stopped supporting the brand.